Ever turn on a water faucet only to find the water is lingering in the sink and not going down the drain? You have a clogged drain from buildup, and maybe other items which can make their way down a drain (but shouldn’t!). Well, picture this image with your arteries: Your heart is the faucet but when it “turns on” – or pumps blood – the blood just lingers and simply cannot get through. The blood tries to push its way through with every pump of the heart and maybe a little gets through, but the pressure against the arteries starts to damage them. Just like how food and hair can clog up a sink, what we eat and low activity can clog up the inner walls of the arteries with plaque. And just like how water pipes can span out and connect to different areas, our arteries span throughout our bodies, reaching all vital areas which require blood. So if our arteries are clogged, our body can’t receive the oxygen-rich blood it needs to function. The end result is a higher risk for heart attack, stroke, and other cardiovascular events and complications. Diet has a lot to do with the health of our arteries. In fact, some foods are responsible for clogging our arteries and others are the best foods to prevent clogged arteries altogether. So if you want to make sure your “pipes” stay clean, here is the diet for clogged arteries and the top foods for clean arteries. If you haven’t been diagnosed with clogged arteries but want to ensure they stay healthy, prevention is your No. 1 defense. If you’re wondering how to prevent clogged arteries naturally, look no further than these 10 best foods to prevent clogged arteries. 1. Leafy greens: Leafy greens are a staple to all healthy diets but even more so in a diet for clogged arteries. Foods like spinach, kale and arugula are some of the top foods for clean arteries. Spinach, for example, is rich in potassium. This is helpful in reducing the risk of high blood pressure. Leafy greens also contain a form of nitrogen from the soil in which they are grown. When this nitrogen becomes digested, it turns into nitric oxide – an important gas which helps to dilate blood vessels and carry oxygen. Increased nitric oxide can also work to lower blood pressure. So if you’re looking for how to avoid clogged arteries, look no further than leafy greens. 2. Fish: Fish is another popular food which tends to make it on the list of healthy eating, but there’s good reason for it! Another top food for clean arteries, fish offers omega-3s which are great for heart health. An easy way to remember which fish are artery-friendly think of SMASH: Sardines, mackerel, anchovies, salmon and herring. These are the best fish to consume when it comes to preventing clogged arteries. 3. Tea: Tea is soothing, calming and offers many health benefits, so it’s a must to incorporate into your diet for clogged arteries. Tea, particularly green tea, contains flavonoids. One flavonoid, called catechins, protects cells and neutralizes oxidation – similar to how premium gas works in a car. Tea can also help block dietary cholesterol and reduce inflammation. If you haven’t been drinking much tea, start with a cup a day. If you are already a tea drinker, aim for three cups a day – but stick with a herbal closer to bedtime so you can easily fall asleep. 4. Oil: Think of oil – olive, canola etc. – as the Drano of water pipes. When your pipes are clogged, you pour the solution down and the clog goes away. Well, oil works quite similar to this. Oil contains omega-3 and omega-6 fatty acids which are good for the heart. These fatty acids are necessary to prevent plaque buildup, which is how to avoid clogged arteries. Canola oil and olive oil, in particular, are also helpful in reducing cholesterol. Swapping out unhealthy fats like butter or margarine with oil is more heart-friendly and one of the best foods to prevent clogged arteries. 5. Pomegranates: Known for their high antioxidant content, pomegranates are truly one of the top foods for clean arteries. Not only do pomegranates prevent the hardening of arteries, but they can also reverse its progression. Pomegranates in a diet for clogged arteries are essential, and whether you’re drinking the juice or eating the fruit on its own, it’s a great way to prevent clogged arteries naturally. 6. Whole grains: Don’t be mistaking this food as a means to enjoy bread and pasta, the secret is whole grains, not the bleached stuff you usually see on grocery shelves. Foods like oats, bran and barley are the best foods to prevent clogged arteries because of their fiber content. Fiber is important if you want to know how to avoid clogged arteries. Soluble fiber works to remove the “bad” cholesterol – LDL – from your body and whole grains provide magnesium which opens up blood vessels. 7. Nuts: Similar to fish and oil, nuts provide omega-3 and omega-6 fatty acids. Nuts also contain magnesium which is useful in preventing plaque and dilating the blood vessels. The American Heart Association even recommends the consumption of nuts, but beware, they are high in calories so try to stay at a few at a time. Nuts are an easy way to prevent clogged arteries naturally. 8. Lean meats: Your steaks may be part of the foods the cause clogged arteries, but other delicious lean meats can help you avoid clogged arteries. Foods like chicken and turkey are great options either baked or grilled. They offer protein and don’t have the saturated fats like red meat has. 9. Spices: What’s easier than getting artery-friendly benefits than from spices? Not only will they give your diet for clogged arteries more flavor, but they are how to avoid clogged arteries on their own. 10. Coffee: Another beverage that can support heart health and prevent clogged arteries naturally is coffee – but take note this should be consumed in moderation and with no added sweeteners or cream. Coffee on its own offers many health benefits so it’s no wonder it can be part of how to avoid clogged arteries as well. Coffee can help lower blood pressure, but it a stimulant after all. Listen to your body and if you notice you’re becoming shaky or your heartbeat speeds up, reduce the amount you’re drinking. Fried foods: French fries, fried chicken wings, etc. Trans fats: Margarine, baked goods, processed foods, etc. Desserts: Cakes, cookies, muffins, etc. 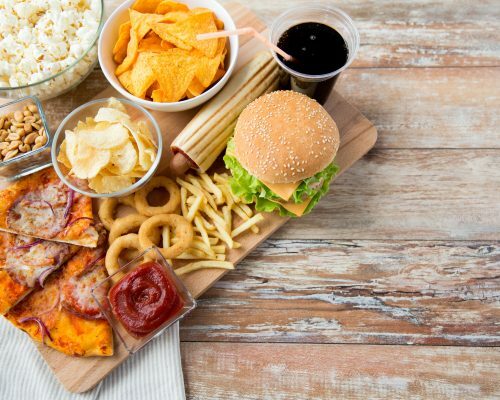 These types of food are not heart healthy and can contribute to the clogging of arteries. If your diet contains high amounts of these types of foods, it’s best to re-evaluate it and make some changes. Essentially, if it’s artificial or processed, it won’t be good for your heart. Don’t think that a diagnosis of clogged arteries is a death sentence; it’s not. Just because a doctor informs you that your arteries are clogged doesn’t mean you can’t start practicing healthier habits to reverse the damage. Here are some ways to unclog arteries naturally and prevent clogged arteries from forming again in the future. If you want to live to 100 (or beyond), you need to make the necessary changes to your diet so you can avoid clogged arteries. Clogged arteries can lead to numerous heart problems which can ultimately result in death. Ensuring you’re enjoying the best foods to prevent clogged arteries will help them continue to perform their function. Just remember, a clogged sink can’t do its job and neither can your clogged arteries. In order for your body to receive the necessary oxygen it needs and remove waste, your arteries need to be as clear as a whistle! Can clogged arteries be unclogged?